Create a custom tea blend with this kit that includes nine herbs and three varieties of green tea. A cup of tea is more than just a handy hot beverage. The warmth soothes your body, waiting for the tea to steep gives your mind a moment to rest, and the different herbs used can calm, stimulate or relax. 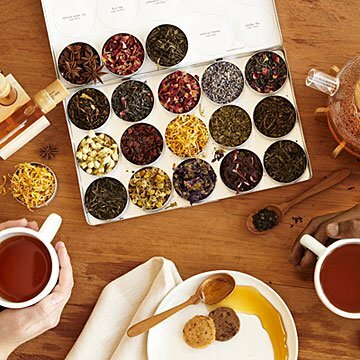 This holistic tea set by Julie Pedersen invites you to sip from an array of nine herbs and three varieties of green tea from Japan, India, and Sri Lanka (there are two tins per type of tea). Steep the loose leaf teas and herbs in the included, reusable tea bags made from biodegradable corn silk. Kit assembled in Canada. Click here to learn how to make herbal green tea using your Green Herbal Tea Kit. Each ingredient tin: 0.9" H x 2" Dia. Each tin holds approx. 1.5 oz. Each kit yields approximately 18 pots of tea. 10 disposable tea bags included. Definitely Going to Purchase Again! I use this product to make beneficial cups of tea in the morning that aid in my digestion, energy, and boost my immune system with plenty of antioxidants. Bought for my mother as present. She enjoys sampling different rates and cultures. She loves drinking tea also. My friend loves this tea set and told me she uses it almost every day! My wife really doesn't like getting tea from package brands unless she can smell the flavors in them. This allows her to pick and choose her own flavor and try new things. My daughter absolutely loved this tea kit. She loves to use natural remedies and this kit allows her to make healing blends of teas. She loves to experiment with the different teas and herbs. It thrills me she is so happy since she is a bit hard to please sometimes. Heck yes get this herbal tea kit!!! Tasty, fun to use, and the perfect gift! We love using this with our electric kettle! Wish there were a few more tea combo recommendations! My wife is a "tea" afficianado and I think she'll enjoy the "experimenting" experience. This is the perfect gift!!! This product is a Christmas gift for my daughter. I cannot wait to see her open it. I know she will love it.